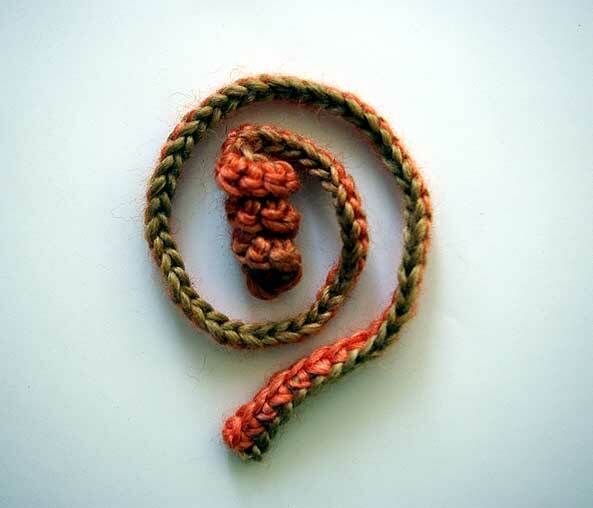 This curly tie makes a perfect key chain, hair tie, handle for your cell phone case or whatever you want it to be. Just adjust the length of the tie! Ch 12, place safety pin to mark, ch 63. Row 1: With wrong side of chain facing, 2 SC in 2nd ch from hook under "hump" (1 thread on wrong side of chain). 2 SC in each of next 11 ch, slip st in each chs "hump" to safety pin, 2 SC in each of last 12 chs. End yarn. Chain may be longer if desired.